A rockin' subject— the original man in black. A game client— the consummate showman. A Johnny well done— One piece at a time. Mike went back to his Glory Days, whiling away the night to the energetic performance by The Boss. To say he's lit up like a kid at Christmas wouldn't begin to describe the triumph and exhilaration on his face from the experience. He took a bit of video with his iPhone. Rumor has it our friend and client, Peter Bauer from The Fund for Lake George got his groove on at the same show. 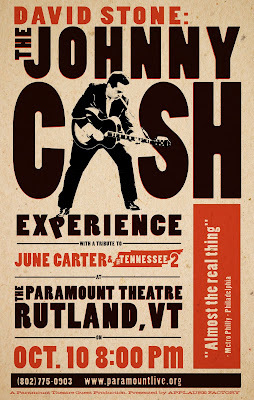 Springsteen is definitely money, but Cash is coming to Walk the Line. The Glens Falls Hospital Foundation is charged with raising money each year for the Annual Fund in order to facilitate the purchase of equipment integral to the hospital's continued success. Last year it was decided through a brainstorming session that tapped into the Board of Directors, staff and community opinion, that linking the next several Annual Funds together would allow for a greater sharing of vision along the path to raising the necessary dollars. A significant portion of the focus was to be on infrastructure and tools used in the Surgical Suite. The idea to open the door and offer an insider glimpse into the people working and the visions being carved for the strongest Glens Falls Hospital was born with the campaign theme, "How We Operate." 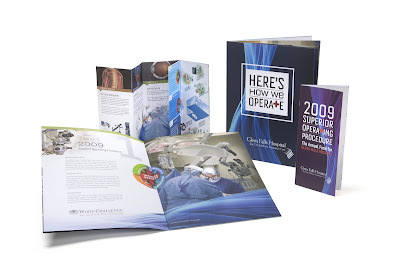 Now, with everything on the table, from the need for improved HVAC to the rationale for moving toward a new frontier in surgical capabilities, the foundation has hit the ground running in order to work their magic to keep the hospital running more effectively with each passing year. Next to "How much weight have you gained so far?" we'd have to say "Have you picked a name yet?" is the most asked question during pregnancy and with 9 Tramplettes, we know. Our own name has sparked many a question, which is why we take helping a client with the naming process very seriously. A business or a product is very much like a baby and the name you select; you have to like it because chances are you'll hear it more times in a day than your own name. Recently one of our clients, Sara Carpenter, made a birth announcement of sorts, declaring the name of her new business. We'd traveled through three rounds of options complete with rough-sketch logos before she made her decision. Together we sat eliminating names for one reason or another, shooting off in new directions based upon information and opinions we wouldn't have had without the spirited discussions after each presentation. It was with clarity, confidence and excitement that Sara called to confirm Qurve Learning as "it!" We'll be back soon to explain more about what Qurve Learning is and how much it can do for human resource directors to medical practices. It became official less than 48 hours ago, Trampoline has gone iPhone-atic. Three new iPhones, making it 5 iPhones and 2 Blackberries in the office. As can be expected the addition of productivity enhancing gadgetry has resulted in a short-term diminishment in productivity. SUBJECT: iPhone, Therefore I am. One of the more seasoned iPhone users in the office recently texted his wife a link to this article. She offers, in her own defense, "I don't bring mine to bed." "What are you saying? I was using it as an alarm. And nightlight." 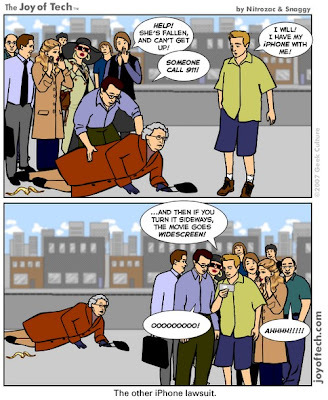 Thanks to CyberNetNews for the comic. Two years ago this September, we had the privilege of announcing the arrival of Sandy Hutchinson's new book. 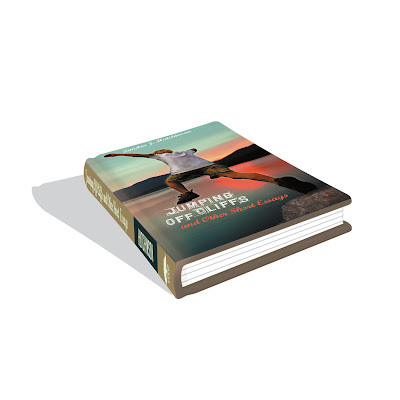 Jumping Off Cliffs is now available at Barnes and Noble. The name is fun, the work is creative, but dang if we don't spend a lot of time with our fingers racing over keyboards and eyes burning at the monitor. Tuckered Tramps. Last Friday we turned the need for a radio spot for Sacandaga Outdoor Center into a chance to unwind. Just like us to take our day of kicking back to some Class 4 rapids. Amphibious iPhone sleeves in full effect, i's dotted and t's crossed (jobs at the printer, websites live and photo shoots scheduled) we hit the Sacandaga at 2pm. The radio spot is in-progress, but the memories and merrymaking are set.